268 pages | 27 B/W Illus. The rise of India and China as two major economic and political actors in both regional and global politics necessitates an analysis of not only their bilateral ties but also the significance of their regional and global pursuits. This book looks at the nuances and politics that the two countries attach to multilateral institutions and examines how they receive, react to and approach each other’s presence and upsurge. 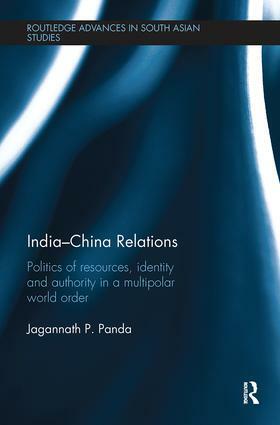 The driving theme of this book is to highlight the enduring and emerging complexities in India-China relations, which are multi-layered and polygonal in nature, and both a result and reflection of a multipolar world order. The book argues that coexistence between India and China in this multipolar world order is possible, but that it is limited to a medium-term perspective, given the constraints of identity complexities and global aspirations these two rising powers are pursuing. It goes on to discuss how their search for energy resources, quest to uphold their own identity as developing powers, and engagement in balance-of-power politics to exert authority on each other’s presence, are some elements that guide their non-cooperative relationship. By explaining the foreign policy approaches of Asia’s two major powers towards the growing Asian and global multilateralism, and highlighting the policies they carry towards each other, the book is a useful contribution to students and scholars of Asian Politics, Foreign Policy and International Relations. Jagannath P. Panda is a Research Fellow and Coordinator of the the East Asia Centre at the Institute for Defence Studies and Analyses, New Delhi, India. South Asia, with its burgeoning, ethnically diverse population, soaring economies, and nuclear weapons, is an increasingly important region in the global context. The series, which builds on this complex, dynamic and volatile area, features innovative and original research on the region as a whole or on the countries. Its scope extends to scholarly works drawing on history, politics, development studies, sociology and economics of individual countries from the region as well those that take an interdisciplinary and comparative approach to the area as a whole or to a comparison of two or more countries from this region. In terms of theory and method, rather than basing itself on any one orthodoxy, the series draws broadly on the insights germane to area studies, as well as the tool kit of the social sciences in general, emphasizing comparison, the analysis of the structure and processes, and the application of qualitative and quantitative methods. The series welcomes submissions from established authors in the field as well as from young authors who have recently completed their doctoral dissertations.